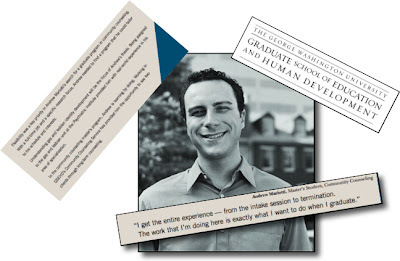 I found a pdf file from George Washington University from the time that Andrew was a graduate student there. They featured him in order to advertise their graduate programs. I used ImageWell and Apple's Preview to edit the pamphlet for this new image. And now? Andrew is a practicing psychologist (research, not clinical) and is planning his Ph.D. studies!